Calista Leah Liew: Diving in Phuket!! We woke up early and got ready to be picked up by the diving company (All 4 Diving). The islands we were going to were quite far away, about a 45 minute drive, so we settled down and napped before arriving at Kata port, where we were all hauled onto the dive boat, the Similan Queen. We settled down, and got ready for a 2 and a half hour journey to the Phi Phi Islands. I woke a couple of times, felt queasy, so promptly went back to sleep. The poor Russian guy was literally green in the face by this time. When we were woken up to get into our wetsuits and put our equipment on, I immediately felt queasy again, but it was bearable. Problem was, we were like the second last group to get into the water, so while we were standing there, all of a sudden I thought "oh no", and before I knew it (this is gross, but I'm gonna tell you anyway), my mouth was full of vomit. As always, I calmly poked my instructor's arm, and pointed to my mouth. He knew what it was and sent me to the side of the boat to let it all out.. Haha.. Told me the fishes would love it.. ;p Talk about immediate relief! I felt better as soon as breakfast was out of me.. Lol.. Apparently, Russian Guy had already thrown up a few times, poor thing. 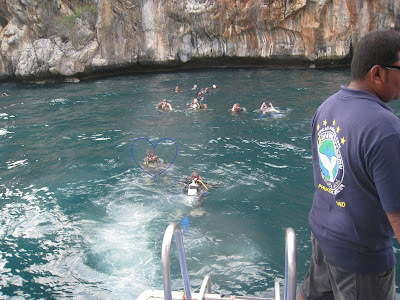 Take this as warning, those of you who are planning to dive in Phuket - get a seasick pill when you get on the boat, the crew will provide them, but you must take it before the boat starts moving as it doesnt quite work when you're already feeling nauseous. We were told to get into the water asap after that, as we would feel better as soon as we got underwater. Russian guy had a little training session before we were allowed under, so I floundered around for a while and practiced what I'd learnt the last time, just in case. Then it was down, down, down! The underwater world is SO beautiful in Phuket.. We saw so many different kinds of coral, fish, and even eels! We were pre-warned to steer clear of sea urchins (there were loads of them) and lion fish, and not to startle the puffer fish (even though I would've loved to see one puff up, I suppose it wouldnt be fair to the fish ey?) The best part, I must say, was when I caught sight of a white tip reef shark! =D A only got a glimpse, as they're very shy and will run away from divers, but it was awesome! We were down there for the usual time of 45 minutes, and I think we went about 8m under if I'm not mistaken. And that was Phi-Phi Lay! =) Next, we went on a much shorter boat ride to one of the neighbouring islands, Koh Bida Nok, which was even more amazing if you can believe! SO beautiful! We went down to about 12 / 15m, cant remember which and this time, we got to see a giant tutle! It was so cute! We spent a good 10 minutes with it I think.. =) We also saw what I thought was a dead fish at the bottom of the seabed, but when we surfaced I was told it was actually a fish which I think may be a scorpion fish, but I cant really remember the name.. If anyone knows, please drop me a comment to let me know! Thanks.. =) I was gutted we didnt have an underwater camera.. =( 1st thing on my list of things to buy (behind getting the actual licence and buying some of my own equipment) will be a good camera and underwater casing! (Will accept as a Christmas gift, if anyone's feeling generous.. ;p) Look how blue the water was! See how rough the sea was? While everyone was having an amazing time in the water, I had a lovely chat with my instructor, who, if I remember correctly, was called Darren. He's Australian, and has been living in Phuket for over 6 months. Most interesting part about him though, was that he used to be a policeman! =D I guess sooner or later everyone finds their true calling and passion.. 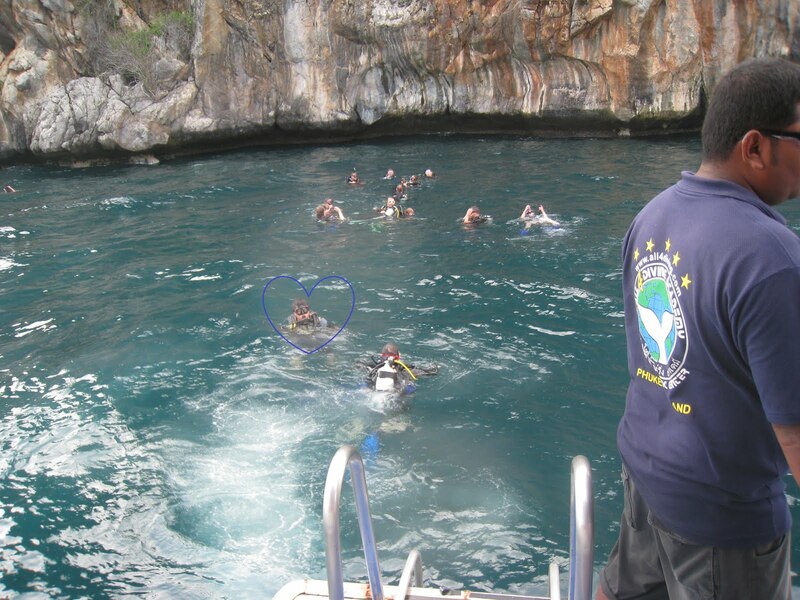 I had a very good time diving with him, he's a very good instructor, very highly recommended! Other than talking though, I also did what I do best - stuffed my face. Darren wasnt kidding when he said the pancakes the boat's cook made were the best! =D I think I had about 3 before I couldnt fit any more in.. Lol.. Yum yum.. With Hershey's Chocolate Sauce! After getting back to the hotel, we had about an hour or so to shower and change, then it was time to go to the famous Simon Phuket Cabaret! We'd gotten VIP seats, which are nearer to the stage for about 600baht each, including transportation. We arrived, got our seat allocations, then went out to take some photos and have a drink at Simon Bar before showtime. =) The show was amazing! Definitely a must-see in Phuket.. The 'girls', and the guys did a really good job of dancing and lip-syncing, too bad no photos were allowed though.. There costumes were really good, and I suppose that's where most of the ticket money goes to.. They performed traditional Chinese, Korean, Japanese etc songs, jazz numbers, and even a funny Barbie Girl performance! By ONE 'girl'! =D I had a really good time, though Ray got fidgety half-way through. He said he liked it, but I guess it was too long for him.. Lol..
Oh, n I remember the massage that almost killed you.. Hahahah..
Got a really nice comment from Littlewing Destinations on a blog group in which I posted a link to this post..
"good travel blog and writing"
OMGGGGGGGGGGGGGGGGG I WANNA GO TOO..!!!!! N i wish u had a pic of this so called me-lookalike.. Hahhaa.. Through buying the particular freshest associated with plants, to help selecting the particular new music, digital photography as well as dealing with the particular difficulties in the event’s logistics – we’ll always be at this time there along, each move in the method, in order that most you’ll should want to do, is point out ‘I do’! Who needs such a big one?? ?